Frederik Willem de Klerk (born 18 March 1936) is a South African politician who served as State President of South Africa from 1989 to 1994 and as Deputy President from 1994 to 1996. 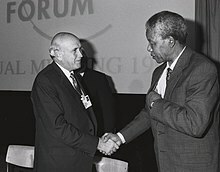 As South Africa's last head of state from the era of white-minority rule, he and his government dismantled the apartheid system and introduced universal suffrage. Ideologically a conservative and an economic liberal, he led the National Party from 1989 to 1997. I'm an African, born and bred. My forebears arrived in South Africa in 1688. My later forebears fought the first modern anti-colonial war on the continent of Africa, against Great Britain. I'm an African, through and through. We're not doing what we do because of sanctions. We're doing what we do because we believe it is right. [A]t the top of the hill, a traveler would sit down and admire the view. But a man of destiny knows that beyond this hill lies another and another. The journey is never complete. There are a number of imperfections in the new South Africa where I would have hoped that things would be better, but on balance I think we have basically achieved what we set out to achieve. And if I were to draw balance sheets on where South Africa stands now, I would say that the positive outweighs the negative by far. I'm a Christian. I'm a South African. I'm an Afrikaner. I'm a lawyer. I love my country, and I think that this country has a great future. In that sense of the word, I`m a practical idealist. I'm certain about my decision [to divorce you]. Stop hoping. History has placed a tremendous responsibility on the shoulders of this country's leadership, namely the responsibility of moving our country away from the current course of conflict and confrontation... The hope of millions of South Africans is fixed on us. The future of southern Africa depends on us. We dare not waver or fail. If our old policy, which was so unpopular in many circles, could work, then we would have surely clung to it. But as responsible leaders charged with the government of the country, we came to the conclusion that the policy we had planned could simply not work. If we dwell on real or imagined sins of the past, we shall never be able to find one another in the present, nor shall we be able to work together on building the future. Here at the crossroads of our history, we need to turn our backs on the past. There are powers that are trying to manipulate our country's history by trying to portray it as dark, suppressive and unfair... Yes, we have made mistakes. Yes, we have often sinned and we don't deny this. But that we were evil, malignant and mean–to that we say "no"! Mandela has walked a long road and now stands at the top of the hill. A traveler would sit down and admire the view. But a man of destiny knows that beyond this hill lies another and another. The journey is never complete. As he contemplates the next hill I hold out my hand in friendship and in cooperation. I should like to make clear that I believe that my political task is just beginning. Everything that we have done so far - the four years of difficult and often frustrating negotiations, the problems and the crises - have been simply a preparation for the work that lies ahead. The greatest challenge which we will face in the government of national unity will be to defend and nurture our new constitution. Our greatest task will be to ensure our young and vulnerable democracy will take root and flourish. I apologize in my capacity as leader of the NP to the millions who suffered wrenching disruption of forced removals; who suffered the shame of being arrested for pass law offences; who over the decades suffered the indignities and humiliation of racial discrimination. Yes, I'm an African, born and bred. My forebears arrived in South Africa in 1688. My later forebears fought the first modern anti-colonial war on the continent of Africa, against Great Britain. I'm an African, through and through, and the fact that I'm white does not detract from my total commitment to my country and through my country, to our continent. Nigeria, it's a beautiful country with a great potential and I believe that in that part of the continent, Nigeria, once it sorts out its own problems, have a crucial role to play, like South Africa has in the more southern part of our continent. [M]y ideal is that what we should do is to, to also rise above that and to achieve true non-racialism. I prefer to live in South Africa because it's a wonderful country; because I've been there for 300 years. Racism is a part of a problem, a world problem, which has to be overcome. We are struggling with racism, but racism is also alive and well in many other countries. And what we must overcome is racism being the cause of conflict. And what we need to recognize human beings as human beings; to award merit. [S]anctions should be reserved, if we think international, for extremely serious situations. There are a number of imperfections in the new South Africa where I would have hoped that things would be better, but on balance I think we have basically achieved what we set out to achieve. And if I were to draw balance sheets on where South Africa stands now, I would say that the positive outweighs the negative by far. There is a tendency by commentators across the world to focus on the few negatives which are quite negative, like how are we handling AIDS, like our role vis-à-vis Zimbabwe. But the positives – the stability in South Africa, the adherence to well-balanced economic policies, fighting inflation, doing all the right things in order to lay the basis and the foundation for sustained economic growth – are in place. I have great sympathy with America. It's very, it's very tough to be the only remaining superpower in the world. Personally, my relationship with P. W. Botha was often strained. I did not like his overbearing leadership style and was opposed to the intrusion of the State Security Council system into virtually every facet of government. After I became leader of the National Party in February 1989, I did my best to ensure that P. W. Botha would be able to end his term as president with full dignity and decorum. Unfortunately, this was not to be. As we did before in 1994, I feel we have a capacity to do so again. We succeeded in resolving our problems by peaceful means when everybody expected war and violence... We have one of the best constitutions in the world. We should be proud of this constitution, which provides the framework for a functioning multiparty democracy, independent courts and other institutions that stand for [the] advancement of human rights... He said the country had already held three elections and that two presidents had relinquished their power through constitutional means. Although former president Thabo Mbeki had left under difficult conditions, even that had been done constitutionally... These are all signs of growing constitutional maturity. Our democracy is growing up and there are open debates which will take us to robust contestations. You have Palestinians living in Israel with full political rights. You don’t have discriminatory laws against them, I mean not letting them swim on certain beaches or anything like that. I think it's unfair to call Israel an apartheid state. If Kerry did so, I think he made a mistake.